While I was thankful for this outcome and proud of the way my team had worked together in an emergency to save the patient’s life, I couldn’t help but compare the experience to the last time I had witnessed a cardiac arrest on the job. That patient had survived, too, thanks to the quick action of the nursing team, but despite my position as a certified Basic Life Support (BLS) trainer, I hadn’t felt as confident participating in the rescue. The resuscitation took much longer with multiple nurses performing compressions in “shifts” due to physical exhaustion. What made the difference between these two experiences? The more recent experience occurred shortly after I had participated in a new form of CPR training. My hospital, one of a handful in the country, had begun transitioning from the typical once-every-two-year BLS certification to a low-dose, high frequency (LDHR) model, which had allowed meto brush up on my CPR knowledge quarterly, in short 10- to 15-minute sessions, supporting mastery of high-quality CPR skills. Russell Griffin: For years, healthcare providers have been required to renew their BLS certification every two years, a common practice for millions of healthcare providers. In more than 20 years of clinical practice, I’ve accumulated a drawer full of expired BLS certification cards in my office. Now I’m working with hospitals across the country, including Paula’s, to forever change this historical practice by emphasizing competence over compliance. For me, the challenges with BLS training are two-fold. First, it’s intuitive that the more you do something, the better you are at it. Is it any wonder that practicing a skill as infrequently as every two years could yield inconsistent results? Second, studies show CPR skills rapidly decay, often within three to six months after BLS training, far before nurses have the opportunity to renew their skills. Survival rates after in-hospital cardiac arrests provide further evidence that there’s room for improvement when it comes to CPR training. In 2016, the survival rate for 209,000 adult in-hospital cardiac arrests was 24.8%, consistent with 25.5% in 2015 and a 22.7% in 2014. Given that unexpected death from cardiac arrest is almost wholly preventable, we have the opportunity to save many more lives. Russell Griffin: The solution is simple—verified competence, with deliberate practice and more frequent training. More than 400 hospitals have implemented the American Heart Association’s Resuscitation Quality Improvement (RQI®) program to provide self-directed quarterly practice sessions, conveniently located on the patient floor, to sustain mastery of CPR skills. It’s realistic: The RQI program presents realistic eSimulation patient cases, which allow nurses to play out a variety of patient scenarios in the safety of a learning environment. In an emergency, nurses can better rely on muscle memory having practiced the correct chest compression rate and depth, chest recoil, minimal interruption to compressions, and avoidance of excessive ventilation on manikins with directive feedback. It’s self-directed.With the option to assess the strengths and weaknesses of their approach in real time, nurses can tailor their instruction to their needs—spending additional time in the simulation environment, as needed between practice sessions, for optimal skills mastery and retention. It’s convenient.While more frequent, many nurses enjoy the convenience of LDHR quality improvement compared to traditional alternatives. Rather than take time away from their shift or, in some cases, day off to travel to another part of the hospital, or even a third location, RQI is accessible on the hospital unit. It’s precise:With human eyes, a BLS trainer can at best make an educated estimate in assessing that a participant’s technique meets guidelines recommendations. Without live and instrumented feedback, it’s difficult to measure critical details such as compression depth and recoil. Simulation technology, including audio and visual coaching, solves this issue. Paula Patterson: Before delivering CPR to my patient, I had taught BLS for 10 years. I enjoyed doing this, in part, because I recognized the need for more frequent exposure to CPR training to feel comfortable in my competence. Without regular experience with cardiac arrests in my line of work, it was difficult to remember, for example, how deep compressions should be or where on the body to deliver them. When my hospital implemented LDHR training, I learned that despite this additional practice and decades of training, there were gaps in my CPR competence. For example, while I had assumed my height had given methe ability to deliver deeper compressions than my colleagues, an RQI session showed them as too shallow. Practicing in the simulated environment, I was able to devise a creative solution: performing compressions from the elevated position of a step stool to get the right angle. I replicated this approach in my patient’s emergency, elevating myself, just as I had done in my training, on the side of the stretcher, to deliver the most effective compressions possible. Russell Griffin: Paula’s experience is just one small piece of mounting evidence that RQI works and could be the answer to improving cardiac arrest survival in hospitals. Can you imagine how many more survivors we could have if all hospitals adopted LDHR CPR training and provided nurses the opportunity to build and maintain complete CPR competency with novel programs like RQI? 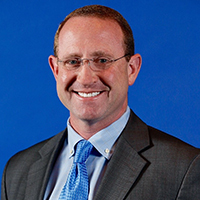 Russell Griffin is vice president, strategic research and innovation at RQI Partners, LLC. 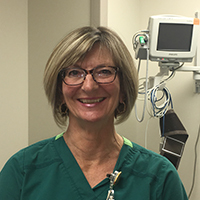 Paula Patterson has served as a nurse in Phoebe Putney Memorial Hospital’s Digestive Disease Center for the past decade of her nearly 40-year nursing career. Bhanji F, Donoghue AJ, Wolff MS, Flores GE, Halamek LP, Berman JM, Sinz EH, Cheng A. Part 14: education: 2015 American Heart Association Guidelines Update for Cardiopulmonary Resuscitation and Emergency Cardiovascular Care. Circulation. 2015;132(suppl 2):S561–573. Niles D, Sutton RM, Donoghue A, Kalsi MS, Roberts K, Boyle L, Nadkarni V. Rolling refreshers: A novel approach to maintain CPR psychomotor skill competence. Resuscitation. 2009;80(8):909–912. Is this program connected to the AHA? Is there a cost to the program?